The cold figure of MÄR, Alviss is the one who brought Ginta into MÄR-Heaven. He joined the Cross Guard in the 1st War Game and grew fondness toward their leader, Danna, with whom he shared the very same goal for which they put their lives at risk, to fight the Chess and protect MÄR-Heaven. This pure courage, however, got Alviss further than he could ever have expected even in his wildest dream: Phantom also chose him as one who would reside in the dreary future of MÄR-Heaven... in the form of a Zombie-tattooed undead. For years Alviss lives under the looming shadow of this most unwanted tomorrow, and recluses from opening his heart for others. 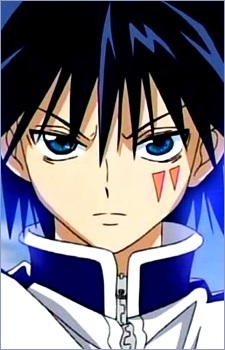 However after meeting with Ginta, Alviss starts to change and finally, stands up facing destiny in full height in order to realize his lifelong wish, the banishment of his hated enemy Phantom, riddance of the curse Tattoo, and peace attained for MÄR-Heaven. A Darkness ÄRM user. He is loyal and protect for everyone that he thinks as his 'friend'.